The Slime is a creature composed by two cubes, the outside one in green color but transparent and the inside one in green color where is its head. This is an hostil creature which lives in the Overworld of Minecraft. Its face have two big eyes and small motuh in squared shape. All the Slime have the same apperance, however you can find three different sizes of this creature. It moves arround the world jumping and doing its characteristic sound. When an Slime receives a player attack, it will divide in smaller part, which will be more difficult to hit. An Slime will always persecute a player who is less than 16 blocks of distance. Either the life, or the power of the Slime attack will depend of its size. The bigger it is, the more life and attack will have. Slime is one of the creatures that have the most faster attacks, in fact they are twice faster in attack than a zombie or an spider. Slimes need a level of light of 7 or inferior to appear in the world. You can find Slimes in swamp biomes of the world’s surface. But also in the mines under 40 layer. 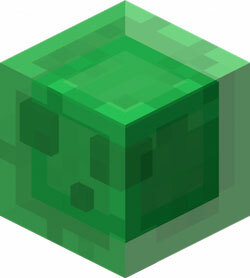 An Slime will disappear if there is any player less than 32 blocks of distance from it.